Francesco Guidolin says he had hoped to manage Watford - but is happy to now be Swansea City's new head coach. The former Udinese boss watched his new team beat Watford after his appointment at the Liberty Stadium on Monday. He will take charge of the Swans for the first time at Everton on Sunday. "I let them [Udinese] know I would have liked to work at Watford, even in the Championship, but other managers were hired," the 60-year-old told Italian newspaper La Gazzetta dello Sport. "Given their results, which include promotion and their good form in the Premier League, they made the right decision." Guidolin left his last managerial post with Udinese in May 2014 and took up a position as technical supervisor for the Pozzo family, who own Udinese, Granada and Watford. The 60-year-old Italian said he had received offers to manage again in Italy, but held out for a chance abroad. "I preferred to wait as I wanted to experience something outside of Italy, and in the end I was rewarded," he said. "I knew it wouldn't be easy as I'm not well-known internationally, but my agent Frank Trimboli did a great job in getting me this opportunity with Swansea." 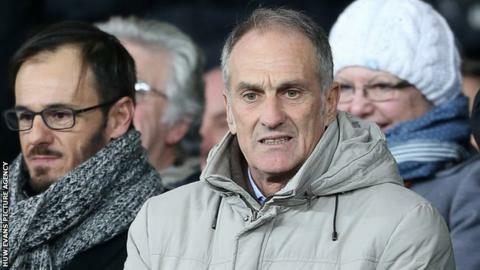 Guidolin has appointed former Chelsea midfielder Gabriele Ambrosetti as a coach and will also work alongside Alan Curtis, who had been interim manager since Garry Monk's departure last month. "The initial signs are encouraging. I was impressed by how cordial everyone was," added Guidolin. "The first half against Watford was our best performance in some time. I have been following Swansea for the past month and I am convinced we have a great base to work from. "I will try to implement my work on things that make a big difference like focus, concentration and intensity while trying to get them to play good football." Guidolin cited the stress of the job when he left his post at Udinese, and he added: "It is my strength, and my weakness. Stress can help you, but it can also hurt you. "When your job occupies your entire day, the results eventually come and that is the secret to my career. However, at the same time, the struggle drains you."